Mobile food vendors are all the rage these days, so I want to know how many of them serve BBQ. So, I begin a compilation of BBQ food trucks. If you know of more, let me know, and I will add them to the list. I’ve been pretty excited about this place as it’s real close to my house! We North Austin folks have been waiting for a place like this. Stiles Switch reminded me a lot of Louie Mueller and of course JMueller. I’m sure we’ve heard that they all derived from the same source. Anyways today I ordered moist brisket, jalapeno cheese sausage and a beef rib. The brisket was excellent; on par w/ any great brisket in town. They take pride in hoping to speed up the process and not have people wait over an hour for food. Jalapeno cheese sausage was also solid; very very finely ground and great flavor. Beef rib was suburb today; my co-worker went last week and said it was not great when he got it; but mine was juicy and great pepper rub. I’ll def. be back as this place is only 5 min for me. The lay out is nice w/ plenty of tables all around and TV’s everywhere. They also served several beers on tap as well as a nice drink cooler. Got these pics yesterday afternoon, to add to our collection of BBQ tattoos. 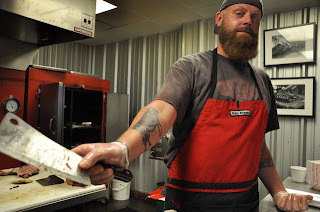 This one's from our friends (and an affiliate of The Q Card) at Hickory House Bar-B-Que in Denison, TX. Cross knives, flames, and a cow head in the center with ribbons that say Hickory House Bar-B-Que. Rack it!!! Yesterday, I posted a video of the line outside Franklin Barbecue. Today, the video of when the door opened a few minutes later. 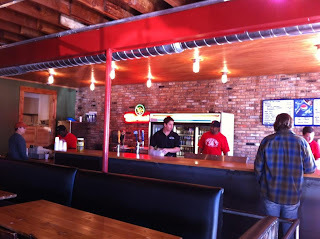 On Wednesday, I had my first meal at Saw's BBQ (Homewood, AL). I pass it every time I go to Birmingham and always intend to stop. Finally did. It's a small joint. One room and a bathroom. Alabama football memorabilia all over the walls, and the lady running the place had a Crimson Tide shirt on. So, right out of the gate, we're in good shape. I wanted a sandwich but couldn't decide between the pulled pork or the smoked chicken with white BBQ sauce. They're the same price, but I was told I couldn't do half and half. I never understand that. Same price! Anyway, I got the pulled pork with pickles. Sauce on the side. I like the simplicity of the sandwich. Bun, pork, pickles. Bun was soft. Pork wasn't dry, but I should've asked for outside pieces, so I could've gotten more flavor. Poured some sauce (very thin) on the side of the basket and simply dabbed the top piece of the bun in it. Liked it. Got turnip greens for my side. A tad sweet for my taste. Only ate a few bites. The iced tea was a homerun: awesome crushed ice; and, unlike most every other place I visit, they brewed it strong enough that it didn't simply look like dirty water. Meal was $9 + tax. I'll go back. 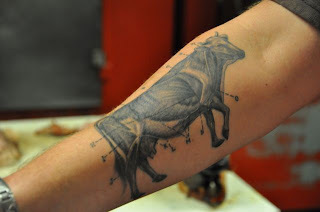 Several weeks ago, I posted pics I took of an awesome BBQ tattoo you can get a peek at when you're ordering at Lockhart Smokehouse in Dallas. Right forearm of the man behind the cutting board, Will Fleischman. Now that I have the pics Brad took, I'm posting on the aforementioned tattoo again. As I said in my previous post, if you have a BBQ tattoo, email me a pic of it! 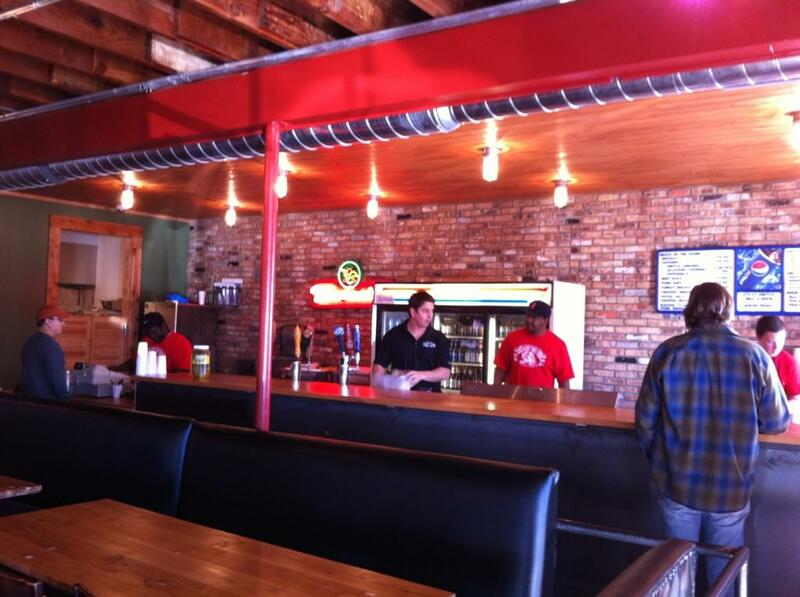 Stiles Switch BBQ & Brew opens in Austin! QOTD: Chopped beef or sliced beef? Founder of Mac's Pit Barbecue passes away. Good times with Diva Q & Bigmista!!! 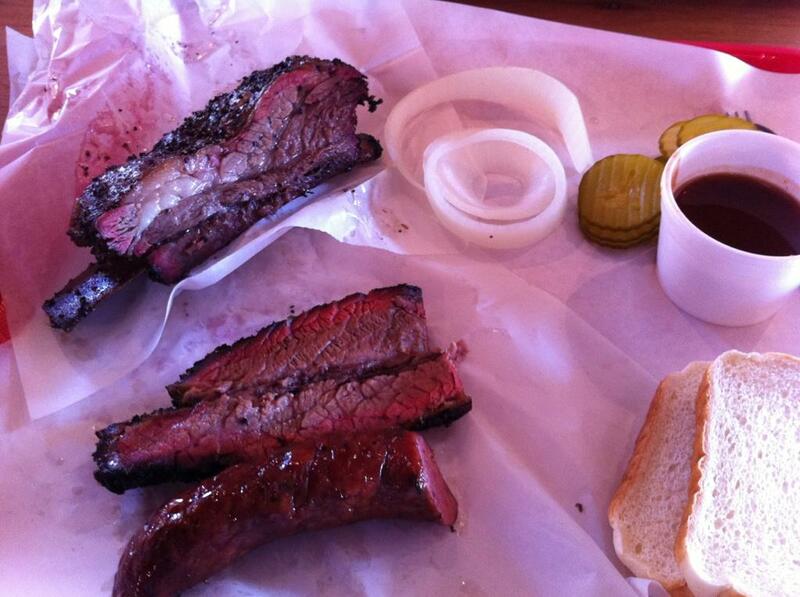 QOTD: What's your single favorite Texas BBQ meal? QOTD: What drink pairs best with BBQ?